Posted on January 18, 2011 by Pavel Y. My new passion is Manhattan. 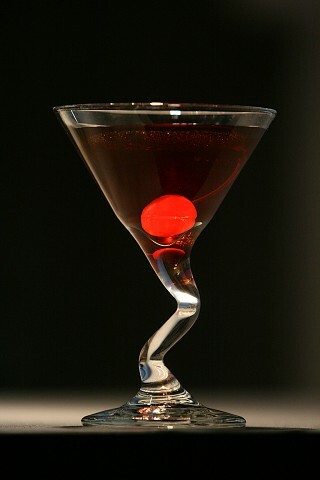 Manhattan is old and classic cocktail with american whiskey (bourbon or rye), sweet vermouth and cocktail bitters. 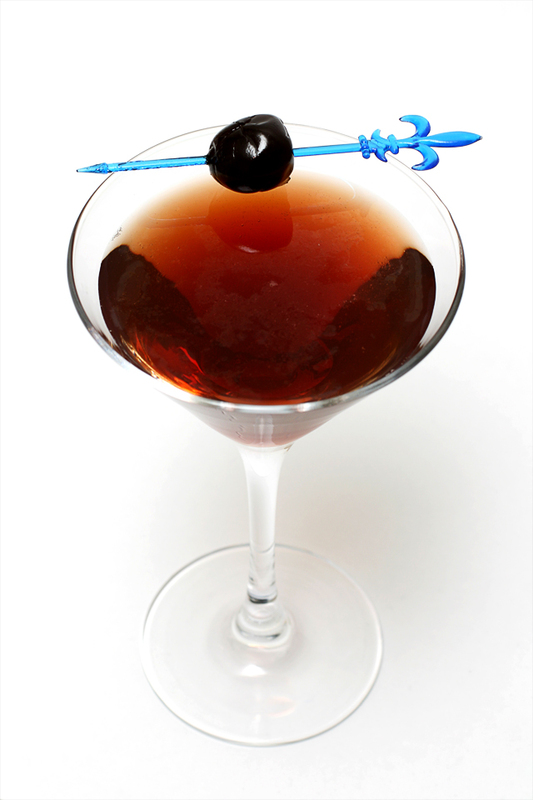 One of the key ingredient of the good Manhattan is vermouth. Unfortunately we have very pour range of vermouth in Ukraine now. There are available Martini, Cinzano and somewhere Gancia. But we have another way to vary our Manhattan expirience – to use Dubonnet instead vermouth in this magnificient cocktail. The vermouth is fortified wine vwith aromatic plant extract. Dubonnet is fortified sweet wine with hint of quinquina. It is so similar stuff. The first recipe of Dubonnet Manhattan was founded at CocktailDB. It is so similar to Dubonnet Cocktail with whiskey instead gin. Stir in mixing glass with ice and strain into cocktail glass. Garnish with a cherry. First I try this cocktail with bourbon whiskey. I use Maker’s Mark handcrafted bourbon. The Dubonnet Manhattan Cocktail is realy very good. This cocktail has very interesting taste with sweet muscat entry with a lot of fresh grapes and fruits, so sweet and smooth palate and great bourbon finish. I try this cocktail with canadian whisky also. The result is quite different. The main palate is sweet wine with a hint of whisky. But both of this cocktails are not Manhattan, actually. Another recipe of Dubonnet Manhattan I found at the great Intoxicologist’s post Make Mine a Manhattan Holiday. This cocktail contain some dry vermouth for good balance. Stir in mixing glass with ice and strain into cocktail glass. Garnish with lemon twist and cocktail cherry. Actually this recipe is promo for Evan Williams bourbon and american Dubonnet (both crafted by Heaven Hill). I use Four Roses bourbon and french Dubonnet Rouge. Also I use only 1 my big dash of Angostura for good balance. The cocktail is excellent! It is very good Manhattan recipe. Dubonnet Rouge and Martini Extra Dry work very well together. The result is great sweet “vermouth” taste. The Dubonnet Manhattan #2 has smooth very good balanced and round piquant taste with main bourbon palate. It is admirable Manhattan! Про увлекательность в наших условиях ты очень верно подмечаешь :) Ну, если гора не дет к Магомету (в виде Капрано Антика), то к горе мы двинемся самостоятельно… Это отнюдь не последний Манхэттен на моем блоге :) Чтобы никто не думал, что имея под рукой только Мартини и Манхэттен не выпьешь, тут смекалку подключать нужно!